After opening an XHTML 5, DITA Topic or DocBook 5.1 document in XXE, you'll find an “insert/add media object” toolbar button allowing to add a media element (e.g. 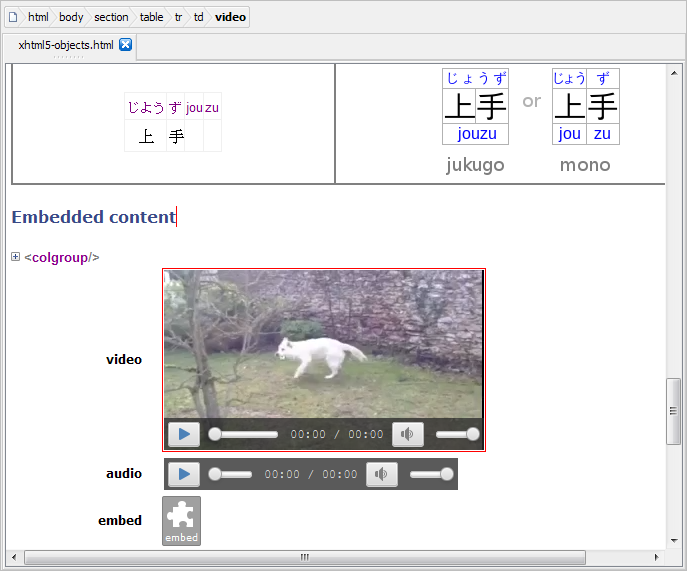 XHTML 5 audio and video elements) to your document. Once properly configured, a media element is rendered by embedding a media player in the styled view. This media player is similar to those found in Web browsers. This feature, which is based on JavaFX®, will not work if the Java™ runtime used to run XXE is older than version 1.8.0_40. Moreover, this feature may be explicitly disabled by unchecking Options → Preferences, General|Feature, "In the styled view, render audio and video elements by embedding a media player". A newly inserted media player is not configured yet (e.g. does not point to any media file) and just looks like a stock audio or video icon. OR drag and drop a media file onto it. The three above actions all display the media player dialog box. This “object view” may be used as a low-level media element editor. It may be used for example to add track child elements to a video element, something that the media player dialog box cannot do (see below). 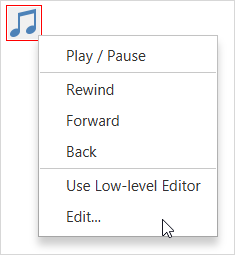 When done with this low-level editor, the "Show media player" button may be used to switch back to the media player.